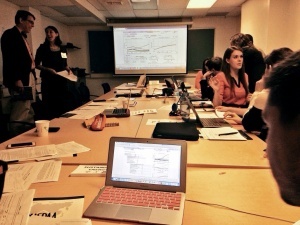 In late February, the Network of Schools of Public Policy, Affairs, and Administration (NASPAA) ran a competition which pitted teams of students from different schools against each other to solve a pressing policy problem. The competition included about 300 students, competing simultaneously in 8 different locations in the US and Europe. The focus was global climate change policy. 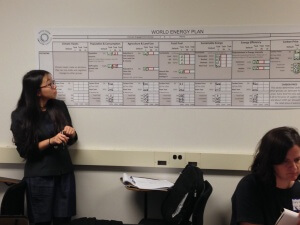 The fulcrum was World Energy, Climate Interactive’s energy policy and investment exercise, using the En-ROADS energy and economics simulator to test policy scenarios. Each team was asked to play the role of staff to the G-20 Group of Nations and make recommendations for policy shifts that would keep global temperature rise below 2 degrees Celsius by 2100. I was asked to be one of three so-called super judges to select the winner among eight semi-finalist teams. We were provided with a 10-15 minute video depicting and discussing the teams’ proposals and “confidential” memos to the G-20 containing the teams’ analysis of constraints and opportunities and staffing plans outlining continuing assistance to the leading nations group. All of the proposals effectively reduced temperature rise while retaining relatively high levels of support from the various stakeholders, including energy producers, government agencies and climate advocates. The main thrust of all eight was the shift from fossil fuels to renewables, the curbing of greenhouse gases from agriculture and land use as well as key industrial policies and the imposition of carbon pricing measures. No surprise here. Nor was it a surprise that almost all the proposals lodged principal responsibility for policy shifts in governments and business organizations. Only the winning proposal took a more nuanced approach, recommending shared responsibility between government and business on the one hand and the citizenry at large on the other. Their argument was that cultural change had to accompany imposed change with GDP growth declining as a result. While all the proposals offered credible evidence for their policy recommendations, the winning proposal ingeniously showed how a carbon tax, operant within several European countries, actually contributed to economic growth levels over the past several years. Intriguing was the tractability of the proposers’ assumptions. Most accepted the assumption that population growth and associated GDP would grow at levels close to business as usual. Only the winning proposal offered a demur to this assumption and the possibility of a different path. The work of these students, all generalist public policy types, was impressive in substance, and perhaps even more so in the less objective realms of motivation and engagement. Clearly these young people saw the exercise as fundamental to their personal futures and they showed this in the quality of their presentations. The simulation itself worked. As expected it served as a superb platform for discussion and proposals on key aspects of the dilemmas facing the planet and its inhabitants. Because the teams had to self-evaluate for feasibility of their policy proposals among stakeholder groups, their work was more anchored in reality than some of the other groups with whom I have worked. Still in my aspirations is the potential World Energy has for the learning of incumbents these students wish to emulate, e.g. mayors, county leaders, state executives, NGO heads. All would gain important perspective and knowledge from half a day wrestling with En-ROADS. And all of us as their constituents would benefit as well. 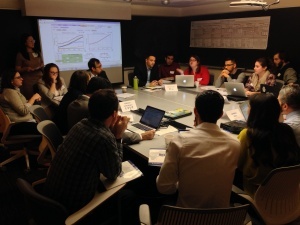 See more photos from the NASPAA World Energy simulation at the Columbia SIPA site. Read the NASPAA press release on the winning team.